CM: Berenice is a multilayered work of art. Each layer in combination with the others creates a space that no individual layer occupies on its own, but one that comes into being through the interplay of all layers together. This effect resonates with the idea that 'one plus one equals three' (1+1=3), an idea that is akin to Joseph Albers' belief that "the space in-between 'is' the work". The challenge then becomes to discover - visually - what it is that exists between the spaces. Berenice has a complicated story, originating in-between the layers of history, ranging from Egyptian mythology and the past of Katsiaficas' family. Berenice was an enigmatic empress who became known for sacrificing her beautiful hair as a gesture of love for her husband, Ptolemy III of Egypt, whom the gods allowed to prevail over the Assyrians. As Berenice deprived herself of her beauty as an extreme evidence of her love, likewise, Katsiaficas' mother, who had a regal presence, had accepted for herself the humiliation of not having during her lifetime - owing to political circumstances - official papers to prove the year and place of her birth. For Berenice, Katsiaficas sourced Orhan Pamuk's (b. 1952) writing "the lament of the past is never resolved". In an attempt to resolve the past, Katsiaficas decided to come up with the lost birth certificate of her mother, who was born in Alexandria. This attempt to resolve her mother's past brought Katsiaficas to Egypt. After coming up with the official records she originally set out to find, Katsiaficas created artworks inspired in Egypt. Berenice is based as much on ancient Egyptian artefacts - such as the wig; crown; lotus; and papyrus - as in the Byzantine motif of the blessing - here in the form of paternal and maternal pair of hands. Berenice deals with the idea of a profound presence, despite the fact the off-register quality gives the impression of a ghost. Though the drawing is simple, nevertheless, the images are off register. The mis-registration of the entire work and the face in particular is intentional in order to create the possibility of multiple readings and to create the sensation of ambivalence, as if to underline the truth in Pamuk's words - that laments of the past cannot be resolved. 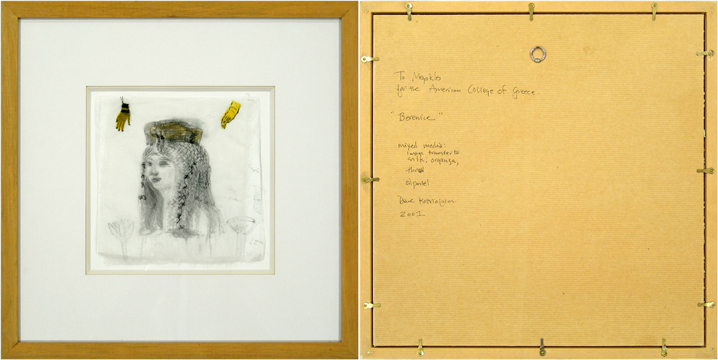 Berenice took part in Diane Katsiaficas' exhibition Visualizing the Instincts of Migration at the American Center of Alexandria, Egypt in 2001.